For musician’s today, one of the best ways of earning money from music is by utilising several revenue streams. The incredible growth of the digital landscape and the increase in tools available has meant that musicians in 2018 can sell their music in more forms and more places than ever before. Any time a new opportunity arises for your music, we’re there. This is why we have decided to launch a partnership with the crowdfunding styled vinyl platform Diggers Factory to help artists produce their records on vinyl. Diggers Factory is a vinyl on demand network allowing artists and labels to produce records thanks to the community, for free. We believe that vinyl distribution and digital distribution can go hand in hand, and this partnership with Diggers Factory will mean that artists now have a unique new tool to promote and earn from their music. 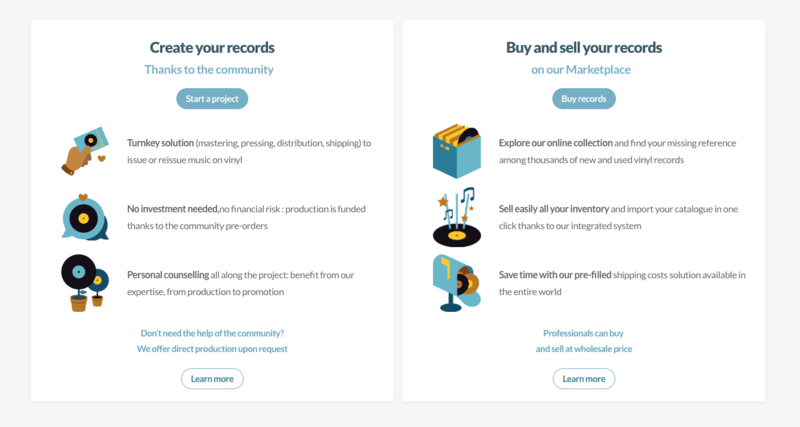 Artists can set the objective of pre-orders (the number of records they want to produce) and estimate instantly their benefits thanks to their integrated cost simulator. All they need to do is share the project with their community and gather enough pre-orders to launch production. Diggers Factory will take care of the rest. No investment needed, no financial risk, with 100% control over intellectual property. Artists can create a tailor-made project and press their vinyl records exactly the way they want. Diggers Factory lets artists choose the finer details of their record pressing, for example: DMM or lacquer? Gatefold? 7 or 12 inches? Colored vinyl? Thanks to a solid worldwide network of partners, Diggers Factory offer optional services like mastering, pressing (average production time with test pressing: 7 weeks), physical distribution and shipping. Last, but not least, artists will benefit from guidance across the whole project: from production to promotion! And if you don’t need the help of the community, direct pressing is available on demand. Whether an issue or a reissue, Diggers Factory will showcase and promote on their platform.